Britain’s Institute for Government, a think tank funded partly by GATSBY CHARITABLE FOUNDATION, provided a guideline on how the UK settlement bill or ‘divorce bill ‘is expected to be calculated. This report released early September 2017 considered factors such as Outstanding budget commitments, EU official pensions, Contingent liabilities and other cost of withdrawals and also considered if Britain will get anything back based on asset and liability balance and finally provided an insight into the implications of Britain walking away without paying anything. The outlines reflect the view of the organisation “INSTITUTE FOR GOVERNMENT” and not the UK government position, but the views are informed by some of the inside thinking of both the UK government and feelers from the EU side. The pace of negotiation no doubt indicates that all the intricacies in this matter cannot be negotiated before March 2019. The EU Budget operates through a multi-annual spending structure, which means projects are paid for over a period of several years. As a result, EU Budget payments are back-loaded and many will be paid out post-Brexit. For example, a key element of EU spending allocations consists of cohesion fund payments, aimed at raising living standards in the 2004 Accession countries. According to the CER, only 25–30% of the biggest cohesion fund payments will actually have been spent by the time Britain is expected to leave the EU in April 2019. The current EU Budget period runs from 2014–2020, finishing a year after the UK’s exit date. A key point of legal uncertainty is the status of financial commitments scheduled for 2019 and 2020. The UK has indicated that it only expects to fund its budget commitments up until April 2019. However, the Commission’s methodology is clear that the UK should meet the full schedule of obligations up until 2020. Like the UK civil service pension scheme, the Pension Scheme of European Officials (PESO) is an unfunded scheme and operates on a ‘pay-as-you-go basis’, with costs being covered by the annual EU Budget as they arise. The Commission outlines that the UK should make a payment to cover the costs associated with this scheme, as they appear in the EU’s consolidated accounts at the time of the UK’s withdrawal. There have been suggestions that the UK could push for this liability to simply cover the costs of UK nationals working for the Commission, lowering the bill due to the under-representation of British officials. The Commission’s methodology suggests that the EU would contest such an approach. The EU incurred contingent liabilities while the UK was a member state. These liabilities effectively constitute payments that would be triggered in specific circumstances only, for example, Ukraine defaulting on its EU loan. When the 2015 EU accounts were drawn up, outstanding loans to Hungary, Ireland, Portugal and Ukraine collectively amounted to €49.5 billion. The EU’s latest approach asks the UK to make a lump-sum payment upfront to cover these liabilities, in case they materialise in the future. This increases the upfront divorce bill by €9–12 billion. However, these upfront liability payments would be reimbursed over the coming years, enabling the UK to recover some of this money. The Commission’s negotiating mandate also includes the “specific costs related to the withdrawal process”. This would cover the relocation of the two London-based EU agencies after Brexit; the European Banking Authority and the European Medicines Agency. Other costs include the decommissioning of the Joint Research Centre nuclear sites and funding British teachers seconded to European schools until 2021. The detail of all the headings that the Commission has put on the table is set out in its working paper “ESSENTIAL PRINCIPLES OF FINANCIAL SETTLEMENT” published on 24 May. 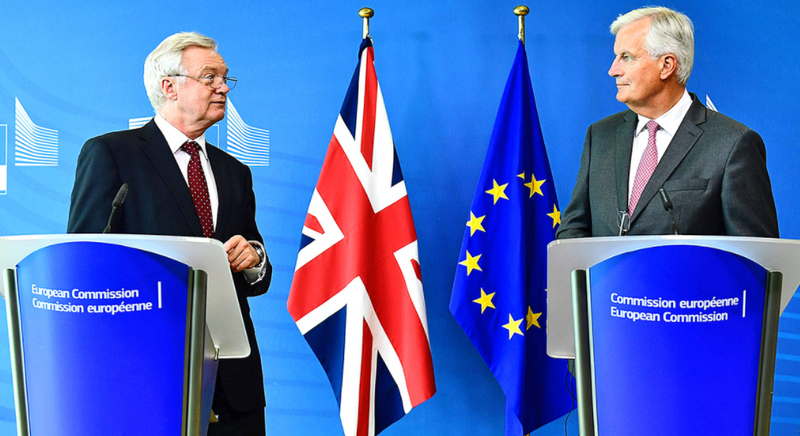 Reports from Brussels suggested that the Commission’s original position was toughened up by member states in internal discussions to include, for example, continued support for CAP payments. Asset shares – this is likely to be the most contentious, with arguments about whether the UK is entitled to shares of the value of buildings and a share of the capital of the European Investment Bank (EIB).The Commission’s methodology outlines that the UK’s paid-in capital to the EIB will be returned, but only after the EIB’s loan book is balanced. The Lords’ EU Financial Affairs Committee reports that the “strictly legal position of the UK on this issue appears to be strong”. If negotiators fail to agree on a political financial settlement, it could become a legal case in the International Court of Justice or the Permanent Court of Arbitration, both located in The Hague. The result of such a court case would be hard to predict. However there have been suggestions that this international arbitration solution would be preferable to a political settlement.